Only in his later years, did my father finally agree to let me interview and record his memories and experiences from WWII...thanks to my kids who wanted to write school reports about him. I have copies of their papers, scrapbooks, tape-recordings and notes, and most recently, the framed display of dad's medals and citations designed by my brother. I'm delighted that his five great-grandchildren are now sharing Grandpa Bickley's story in their classes! 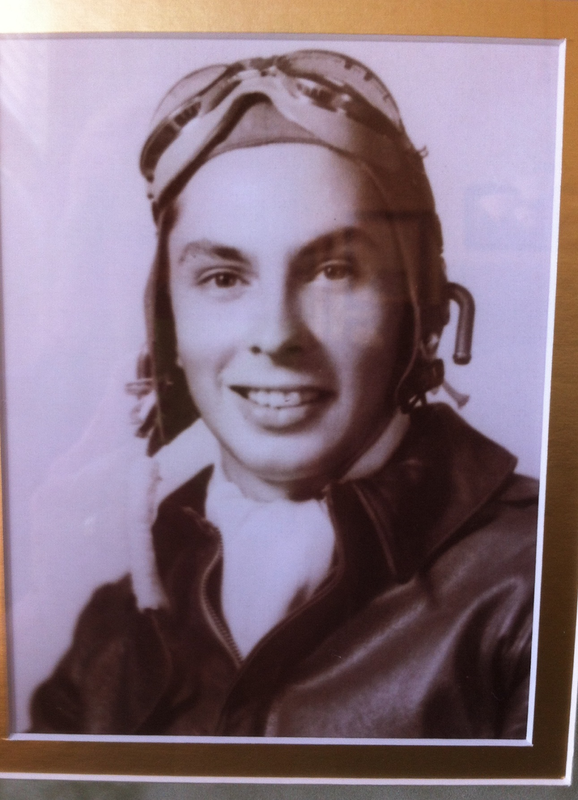 On his 18th mission in July, 1944, my Dad's B-17G Bomber was hit by flak while flying over France. As the plane began to tumble, the tail gunner pulled him up and out of the turret and they jumped along with the others on board. Fumbling with the parachute clutched in his arms, it accidentally opened too soon. Floating over France for some 40 minutes, he never lost consciousness and landed hard in a field spraining his ankle. He hid for hours in thick, thorny bushes near Rouen, watching the polished boots of German soldiers round up his mates and evading capture by holding his breath as they "poked around just inches away." Taking a chance; he eventually started waving and limping toward a young boy pushing a plow. Pointing and gesturing excitedly, the 12 year-old indicated my Dad should "follow the fence" to the back of a farm in the distance. The farmer's family welcomed him into their home and quickly summoned their neighbor; a Count and wealthy landowner who headed the local French Underground. The small village of Preaux was ready to do their part; having agreed before hand how it would work if an allied soldier needed protection. 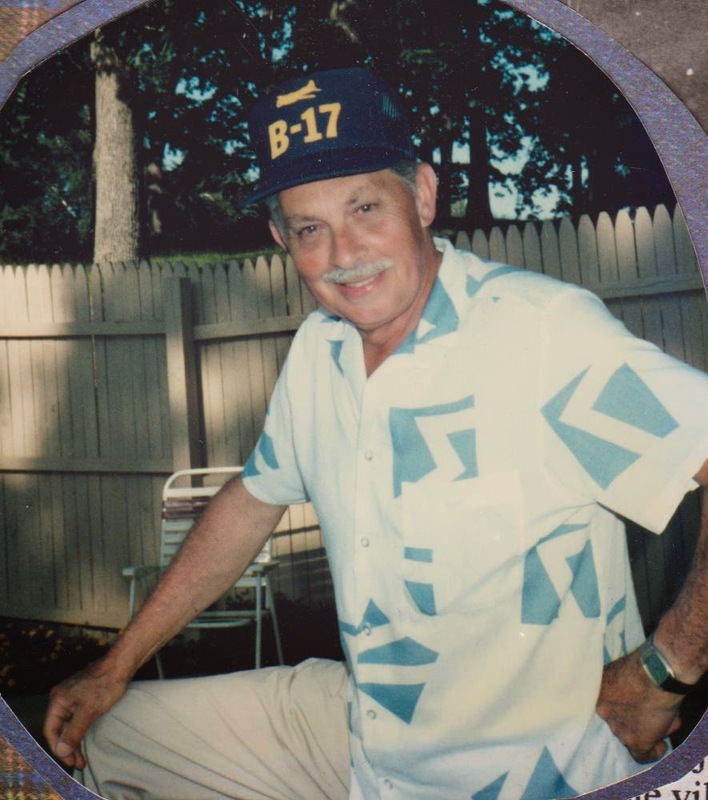 With new clothing and a new identity, my dad lived for two months with various families. He grew a bushy mustache, went by the name of Pierre and quickly improved his high school French. S/Sgt. Bickley was a turret-ball gunner. It became a scary "game of hide-and-seek" with German troops searching barns and cellars daily and Dad riding his borrowed bike to a different place each night. When he and I talked about 15 years ago, he told of the relaxed and "homey" meals prepared by the farm wives and how all the kids called him 'mon oncle." At one home, the family goat was slaughtered and served for dinner in his honor. He'd acquired the accent listening to his hosts so well that when he reunited with members of his crew living in the next village several weeks later, they couldn't believe how French he sounded. After 70 days, the advancing Canadian armored ground forces made their way to Rouen. With his altered appearance, clothing and accent, he had to convince them he was indeed an American! He traveled with the allies through many towns and villages celebrating the liberation of France; finally boarding an RNF warship across the English Channel and back to his base in England. A month later, he was back in Detroit to visit family and see me...his newborn daughter! 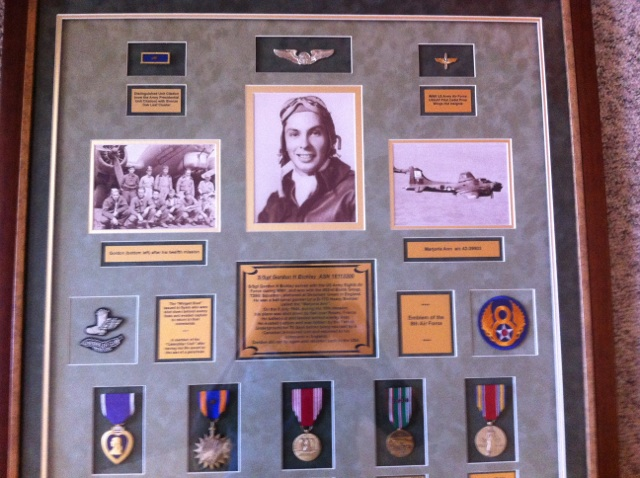 He continued to serve as a pilot trainer in Texas until his discharge the following year. I never heard him talk about any of this growing up; didn't know a thing about it until the night we had a special visitor. I was 16 and my brother 12. A news team arrived at our house just as my father returned from picking up Count Francois de Boisgelin. 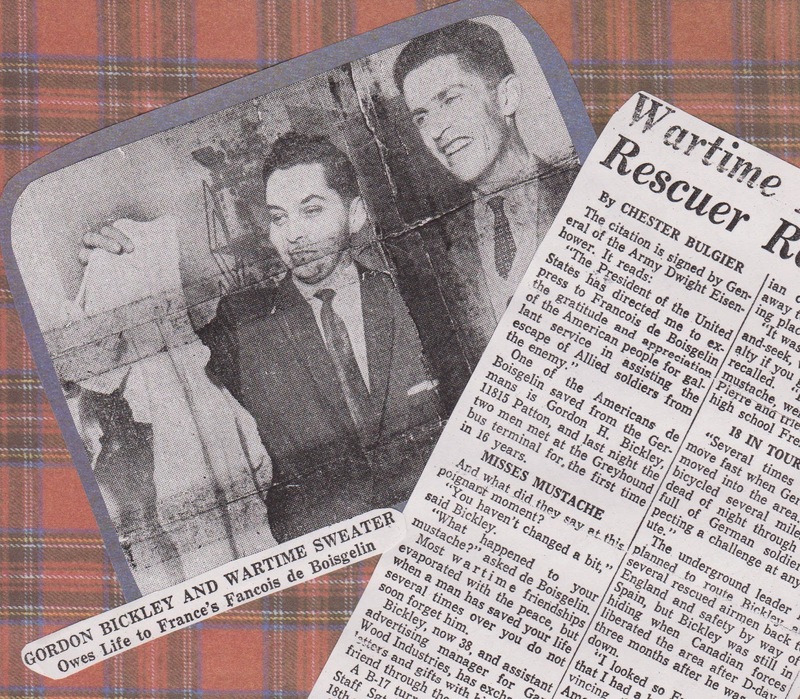 It was a big deal; this photo and article hung on the den walls for years; proudly showing off the citation of "gratitude and appreciation from the American people for gallant service in assisting the escape of Allied soldiers from the enemy." Signed by President Eisenhower, copies were given to members of the French Underground as well as the airmen whose lives they'd saved. But whenever asked about it, Daddy never offered more than we already knew. Years went by and bits and pieces would emerge whenever he discussed war-related things with my uncles or brother. 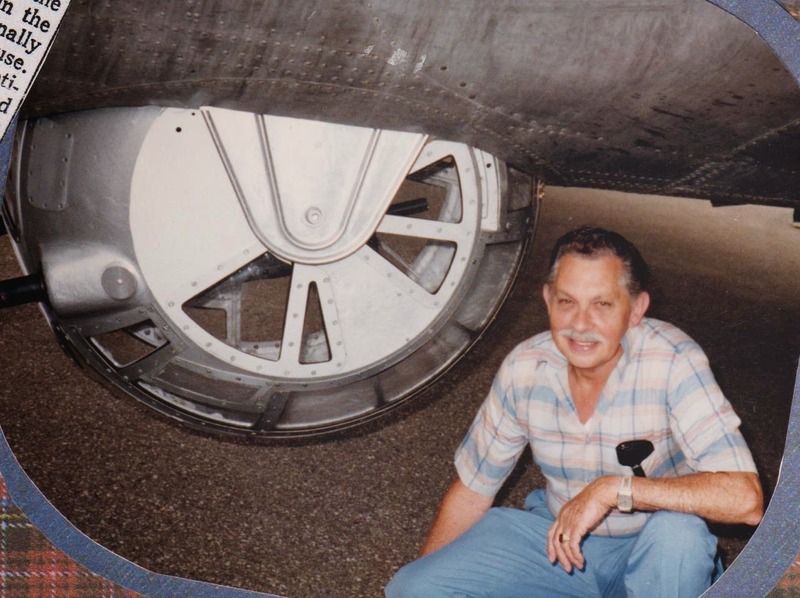 Spending a weekend with me one summer in the mid 80's, we all toured a display of B-17's at the local airport. Boy, did he enjoy that! "How did I ever fit into this thing?" he wondered over and over. He loved walking through the plane's narrow interior, recalled freezing cold hands and joked about his buddies. It didn't occur to me to write anything down. Luckily, he grew more comfortable sharing as time went on and agreed to be "interviewed" by me, the family historian. He never mentioned fear; "we just knew what to do and did it" he said nonchalantly about the moment they were hit. Sweet details like Francois checking on him every week and handmade hand-me-downs that he thought too small, but were in fact just the right size for a skinny guy on the run. 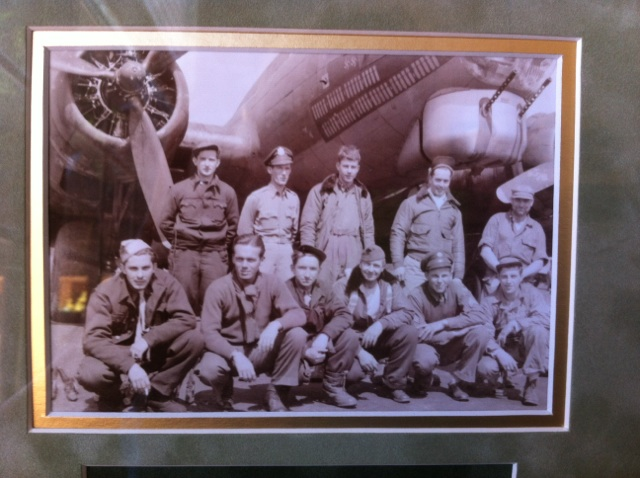 In researching details to add to the medal display, my brother found that all crew members had survived that summer day. It was nice to learn that they'd either been hidden as my dad was or captured as prisoners of war...and all were eventually rescued. I've shared this with various organizations who preserve the integrity and heroics of WWII veterans and I get teary-eyed every time I hear them referred to as the "Greatest Generation!" 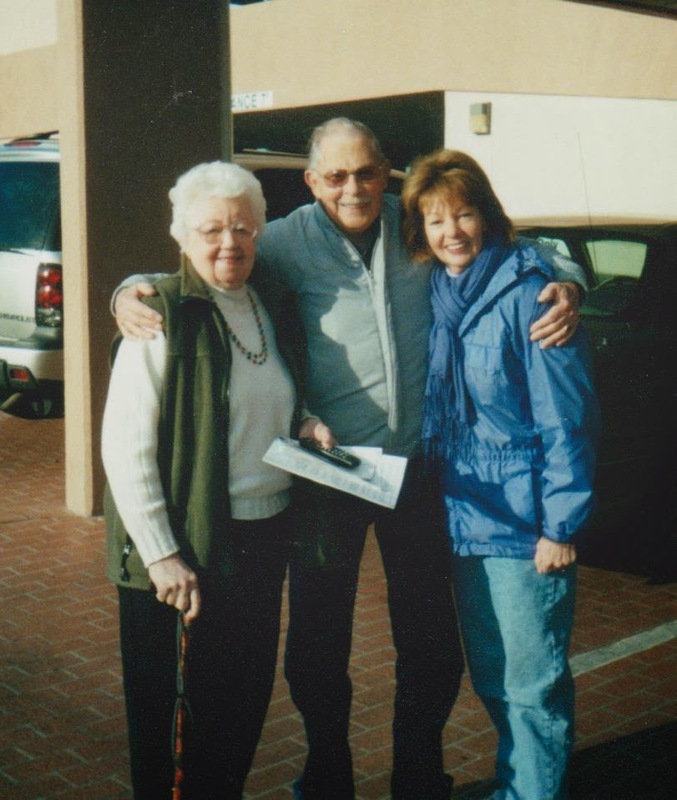 With my parents a few months before he died. He's been gone several years now. Healthy, energetic and always ready to try something new; he passed away a few days after getting light-headed after his daily walk and chores. Yes, he'd had a heart attack at age 50, but as he told me minutes before he died; "I've been thrown a curve ball...they say it's my lungs!" The WWII Memorial opened that fall; something he'd been looking forward to. My husband and I were among the first visitors; placing copies of these articles and photos along with so many others who'd come to honor their Greatest. What a beautiful story and such great pictures, too. Veterans Day is always hard for me -- really makes me miss my own Dad and my Uncle who both served in WW2. There were very special people -- thank you for sharing your story. Thanks Kc...I remember the stories you've written about your dad. I hope Amara has the chance to share his bravery in the war. So touching. Glad I read your story today. He sounds like a wonderful man and father. Such an exciting, interesting story. My attitude toward the FRENCH just improved as well. I'm very much like him and proud of that! The FU was an amazing organization......wish their were more stories and movies about them. Thanks for reading and commenting! What a great story! Your dad was a true hero and a very lucky man. It's wonderful how you preserved these memories for younger generations and how proud you must be! Thanks, Rena. I'm grateful to my mom for being such a packrat....she saved every little thing of theirs and her 4 kids! My oldest grandgirls knew him and share his story too; keeps our family legacy going! Wow! What a history! You should be very proud. I wonder what happened to the hand-me-downs?! I am indeed, Mithra...thank you so much. The sweater he's holding was the one he was wearing the day he was rescued; I love that he kept it all those years! what a wonderful story. How lucky your kids and grandkids are to know the heroic tale and the man behind it. Few of us have as dramatic a story to tell, but it is a reminder of how important it is to share highlights of our lives with our grownkids and their kids. Thank you. Family history and geneology have always been a part of our lives...even when I was a kid. I'm glad I can keep it going for my gradkids! What a wonderful tribute to your father. My mother was a WASP and flied the B-17 Bombers too, but she was here in the States. I love reading these stories, like your father, my mother was very humble about her service too. So glad to have seen your post over on the Midlife Blvd FB thread. Oh how wonderful! Have you written about her serving during WWII? What a great post that would be. Thank you for taking time to read and comment....I appreciate it! Sooo proud to be his great niece!!!! Nice to see another post from you, Joan. I'm glad your father shared some of his experiences. I had several uncles who served, including one who was in tanks and one who who flew fighters (P51 Mustangs in WW2), but they never talked much about it.